Hey! Seems to be a good compromise! I would like to keep using my “old” MacPro. Hey Alex, did you do any research into the feasibility of this? It sounds harder than making an expansion chassis to me, if only because a chassis can be put together with off the shelf parts and reference drivers, whereas this card would be the first of its kind, as far as I know, and require totally custom software. It would be cool, it just sounds hard. I agree, this does sound hard. Hopefully its is more of a software problem than an engineering challenge. I know so little about this could be done, so didn’t know where to start. It is likely that the Mac CPU would have to run so that special firmware would make components available to the pre][pro card. PCI’s bus mastering means that the card would be able to control communications with other cards, but I don’t know if the card can control transactions via the CPU (hence the need perhaps to connect internal SATA busses to the card directly. I only came up with the idea, I don’t have any plans to organise making it into a product. I hope someone makes me one as a present! What PCI cards do you really need? AJA will likely offer a Thunderbolt solution (if they haven’t already, I need to check their website). SCSI? Not really needed with a new MacPro that can handle 4K. Display card? I think it includes a nice dual 4K display option and there will be Thunderbolt solutions. The old macpro feels like a big classic muscle car. The new macpro is more like a lamborghini egoista. Child is Father to MAN!! Makes sense to me! Don’t you think Sonnet will have something out for Thunderbolt 2 before this could be done? Maybe their existing products probably already work with TB2. There are already Thunderbolt PCI expansion boxes. I hear the dual dixie cup interface with dc to daylight nanofilament thread is the coming thing for the Mac. It is great, it permanently has a bandwidth of whatever the most recent version of Thunderbolt exists plus one byte! Pity it also relies on a constant supply of unicorn tears. While an interesting idea, the issue which seems to be at odds with me is the bus speed. If you have multiple PCI ports accessed through 1 port, the access port becomes the bottleneck (not the cable). I would be satisfied with a Thunderbolt PCI card for my Mac Pro. Even if it didn’t support video (Thunderbolt Lite, T-Bolt, Thunderclap, ?). Intel says that the Thunderbolt chipset must be on the main logic board, not on a PCI card. If you can use a RedRocket on a MacBook Air using Thunderbolt 1, then this would work too. The 2013 Mac Pro will have six Thunderbolt 2 ports shared between two buses, so the maximum theoretical bandwidth will be 40 Gb/s – that should be enough for most setups. …apart from the fact that this might be technically impossible in a number of different ways. I hope Sonnet and others take this idea into consideration. The first compoany to say they’ll do it can event use the imaginary name for the product for free (as long as I get a couple of free cards) – Google hasn’t found any other instances of pro][pro on the internet! Only 4 memory slots! How many do you need…? This is a pointless argument. How do you know that the GPU is not upgradeable? Are you an Apple engineer? That’s a cool idea! I’d be in. Somebody has a sense of humour then… I can’t wait to dump my 2008 Mac Pro for the new one! Would be great if they’d make a card like this for PCs too so I could add Thunderbolt to my LGA2011 motherboard. Seem to remember reading that there is a technical limitation preventing this as you may need Thunderbolt support in your MBs chipset (which the old Mac Pros wouldn’t have). I’m probably wrong about that. Would be a handy expansion card if it’s feasible. Intel say that Thunderbolt on a PCIe card isn’t possible. My solution isn’t a Thunderbolt card in the old Mac that can connect to the old CPU but a bus master card that can initiate transfers across the PCIe bus if need be. Crap, I was looking on images.google.com and saw that… I came here to buy the damn thing!! An excellent idea. Also, how about putting the new MacPro inside the old case? A non-starter for me. That mac pro that you’re turing into an expansion chassis is probably worth somewhere between £800-£1500 ($1000-$2000?) – people don’t just keep them when they buy a new mac, they need to sell them to fund the new one. For me, thunderbolt is far too flimsy a connector to consider using professionally anyway – apple should have developed a proprietary heavy duty connector which connected to a dedicated expansion chassis (housing hard drives, optical drives and pice slots). I actually came up with a solid concept of my own that would keep the Current Mac Pro case in great use with a few mods. My idea was to look for chassis online and completely gut it. 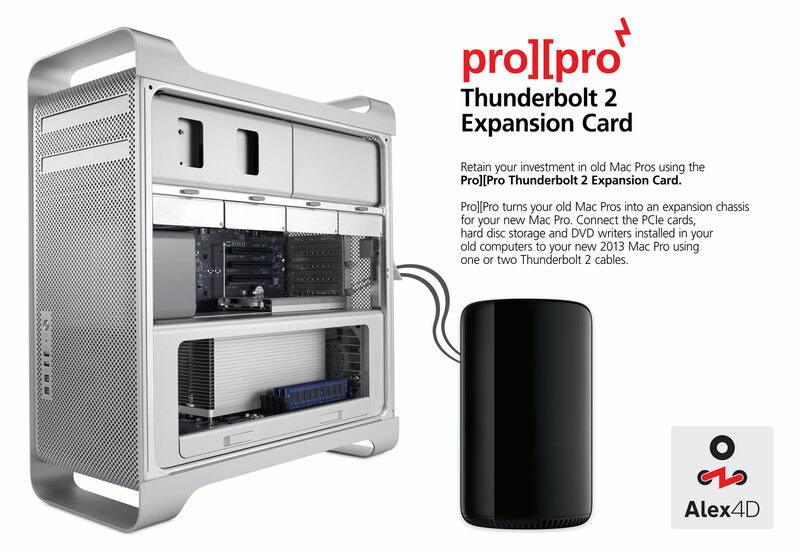 Use the case to house the NEW Mac Pro and all of your expansions (i.e. Storage, Drives, etc) I am planning on mounting everything inside and making sure the ventilation is superb via a Controllable fan kit.. I am sure this is going to be an easy task after i get my measurements down and blue print.